In this novel, Ludwig Horace Holly and Leo Vincey (from H. Rider Haggard's novels about Ayesha, aka She-who-must-be-obeyed) encounter a Norwegian named Sigerson in a Tibetan monastery. 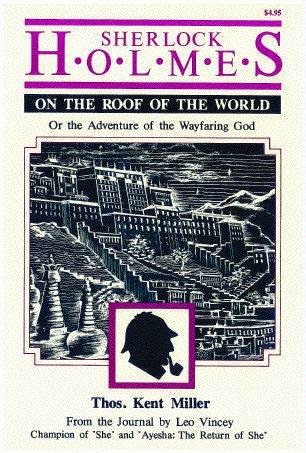 Sigerson, whom readers of Conan Doyle's "The Adventure of the Empty House" know is a supposedly dead Sherlock Holmes, investigates the murder of the monastery's head librarian. Kent has written two more Holmes pastiches, both featuring Haggard's Allan Quatermain and other literary characters, The Great Detective at the Crucible of Life (which Win included in Volume 1, along with its predecessor) and Allan Quatermain at the Dawn of Time, which will be in the new volumes. Two continuity-related matters must be noted regarding The Great Detective at the Crucible of Life. The death of Axel Lidenbrock (from Jules Verne's Journey to the Centre of the Earth) must be exaggerated, as he appears alive and well in the first chapter of John Peel's serial story "Return to the Center of the Earth" (set in 1872) and Pete Rawlik's story "The Issue of Dr. Jekyll" (set in 1882), and is mentioned as having encountered General Zaroff (from Richard Connell's "The Most Dangerous Game") during World War I in Joshua Reynolds and Micah S. Harris' novel Jim Anthony: Super Detective Volume Two - The Hunters. Secondly, as Win noted in his writeup for the book, Miller must be incorrect in his speculation that Professor Moriarty was really Sherrinford Holmes, Sherlock's older brother, and that Sherrinford was also Jack the Ripper. I liked this one, thoroughly enjoyed the second one, and had the great pleasure of copyediting the recent third book.